GALION — Galion Primary School, in cooperation with the Galion MOMS group, is showing its support for community members serving in the military through the “Support Galion Troops” program. The school district-wide drive begins Monday, Oct. 31 and concludes Monday, Nov. 14. The Galion MOMS (Mothers of Servicemen/women) group was founded by two Galion mothers whose sons were deployed. What started with one lunch and two women has grown to monthly dinner meetings every second Tuesday of the month and a meeting the fourth Friday of every month to pack boxes. The goal of the “Support Galion Troops” program is to collect care package items to send to servicemen and women from the Galion area or that have ties to Galion. Collection boxes will be in the lobby of Galion Primary School. 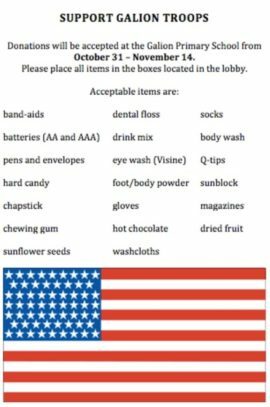 Donating items is not mandatory for students, but the school would like to show the building’s high level of respect and gratitude to our troops. For additional information about how you can help “Support Galion Troops” through this program, contact Voss at 419-468-4010 or email voss.cindy@galionschools.org. Items being collected during the drive include: Band-aids, batteries (AA or AAA), body wash, hard candy, chapstick, chewing gum, dried fruit, dental floss, drink mix, eye wash (Visine), foot/body powder, gloves, hot chocolate, washcloths, socks, pens and envelopes, Q-tips, sunblock, magazines, sunflower seeds.